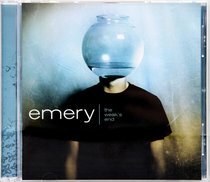 In 2004, South Carolina natives, Emery did something amazing: they went from near obscurity to undeniable success and popularity, all in a year's time. The main factor that spurred their sudden fame was the release of their critically acclaimed debut THE WEAK'S END, which has now sold over 55,000 copies. This CD is both intricate and forceful; the band's message, resolute and meaningful. The album literally bubbles over with the kind of musicianship that threatens to invent a new genre of music, while all along holding fast to passionate beliefs in love, faith and hope.